Choosing a career in ichthyology means deciding to study fishes, sharks, rays, sawfish, and more. Not everyone in the field chose their careers for the same reasons. 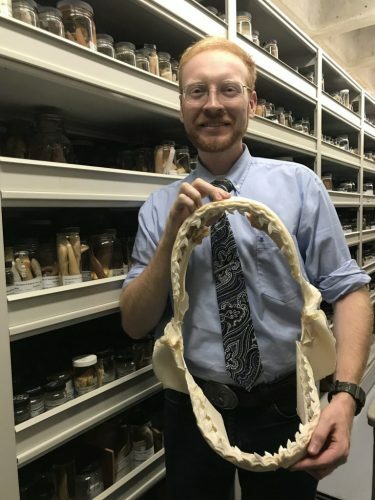 here are some of the current and previous Museum ichthyologists’ stories. What interesting discoveries have you made in your studies? How did you become interested in ichthyology? What personal qualities are important in this field? What skills do you use on the job? What is your typical work schedule? Does this profession require any travel? What is the general salary range for someone in your position? How long have you been an ichthyologist? Is it difficult to find a job in ichthyology? Have you ever considered a career in a different field? Do you ever go fishing in your free time? Keeping aquaria and breeding tropical fishes in high school. A bachelor’s degree in biology from the University of Florida. Exploring rivers and collecting fishes in Southeast Asia. There are other fields? In college I thought about being a schoolteacher. If you’re an avid fisherman or you have more fish tanks than pairs of shoes or Shark Week is your favorite holiday you can turn your passion into a career! Getting involved with your local aquarium or nearest natural history museum is a great way to start. Dr. Franklin F. Snelson, Jr. I became interested in the marine world when I was doing my certification dives for my SCUBA certification (16 years ago). I became interested in ichthyology as a career when I took an Oceanography course in college. I have a B.S. in Zoology and an M.S. in Marine Science. I think that it is important to be able to work well with others. Much of the field involves collaboration and working with other scientists. I think it is important to be relentless in your approach to your studies. Opportunities and money are very difficult to come by, so it’s important to really “stick with it”. It is also important to be able to juggle a couple of different things at once, or multitask. My current work entails assisting in the management of the International Shark Attack File. My graduate research dealt with the systematics (specifically the taxonomy) of a deep-sea shark. A skill which I’ve noticed is important in all the jobs I’ve had in this field (including this one) is organization. It’s important to be able to work well with others. It’s important to be resourceful, diligent, focused, and flexible. I discovered a new species of deep-sea shark. My typical work schedule is 8-5 M-F in the lab/office. The people. I’m surrounded by so many intelligent and interesting co-workers. I also really enjoy the subject of my work. I think it’s important to do for a living (M-F) what you want to do as a hobby on your days off. Some jobs in the profession can require quite a bit of travel. My current position requires no travel. Positions such as this can expect to earn 20-30K. This depends heavily on education and the type of institution you work for. I began my education as an ichthyologist as an intern (at Mote Marine Lab) about 10 years ago. I think so. A lot of it depends on your connections within the field and your flexibility with regards to relocation. But there seem to be a lot more marine biologists than there are marine biology jobs. As an undergraduate I considered a career in medicine. I don’t fish much anymore (I used to fish quite a bit).